Welcome back to the cool sides of Manhattan! Take this literally: It is so cold in New York that long walks and picnics in the sun are an illusion. You want to stay insinde as much as possible. So I did and experienced a lot of culture. Read about MoMa, galleries in SoHo and and a film festival in the Lower East Side and see all the pictures in Stylewalker@Flickr. First the unavoidable Museum of modern art. Known for its huge collection of world famous pieces of modern artists like Magritte, Kandinsky, Cézanne or Matisse. Schade, most of the pictures I had already seen in print; and although an original transmits much more than a dull small copy in a book, the exitement is not really there anymore. Actually my favourite picture was this (haha- really!). I was most fascinated by their current exhibition Onsite: Architecture in Spain and the biggest irony was: For seeing the most beautiful part of Barcelona’s new Mercado Santa Catarina, it´s multicolored roof, I had to go to New York! The market is not even 5 minutes from my flat and I pass by it almost every day. Without seeing the roof. 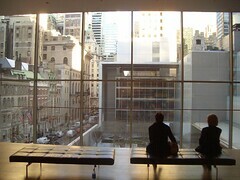 The rest of Moma was nice but actually not too exciting. Still, a visit is highly recommended, if not for the art, at least for the architecture and the atmosphere. In the part of Manhattan called Soho (“South of Houston”) you will find a lot of galleries and fashion stores. It is a beautiful neighbourhood but very commercialized and adapted. Nice art, really, but nothing revolutionary that could knock you off your feet. Not even the wanna-be provocativeness of Ben Stupak at Deitch gallery in 76 Grand Street and his “Radical Earth Magic Flower” which was basically a remake of Jack Smith’s movie “Flaming creatures” from the sixties. Banned by NYC court and provocative then. Not any more. Much better is the Lower East side. 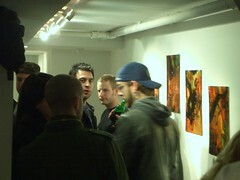 Not only did we ran into the opening of an tattoo and graffiti exposition by Troy Denning (He had free malaysian beer. Very good. Always bribe the journalist.) at Invisible NYC at 148 orchard street but also we encountered the fourth Red Shift Film Festival (click for a great trailer!) 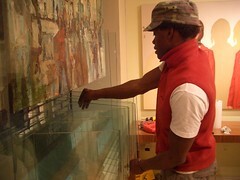 titled “Nomads, Travellers and Migrants” in Anthology Film Archives, 32 2nd Avenue. While the first part was all about how NOT to make a movie, packed with aesthetical crimes that were supposed to be either “arty” or “culturally interesting” but were basically nothing but “my first experiences with a video camera”, the second part had some breath taking animations. Unfortunately, I only found one online: Ministry Messiah by Gint Apsis from Riga, Latvia. In the first row, in front of the big screen with a fat subbass sound I sat there with my mouth open. These are the moments I am looking for. And I am glad that they still occure once in a while.